Just to come clean, I'll be forthright and tell you that my boys are a little weary of quinoa. They try it and eat a bit, but they aren't huge quinoa fans. Yet, I know many a parent who have kids that gobble this wonderfully healthful (lots of protein and fiber, one of only two "complete protein" in the vegetable realm) grain, so here's hoping your little ones fall into the latter category. Perhaps playing up the "rainbow" qualities of this beautifully vibrant salad will help convince them that they want, no need, to try this quinoa stuff. 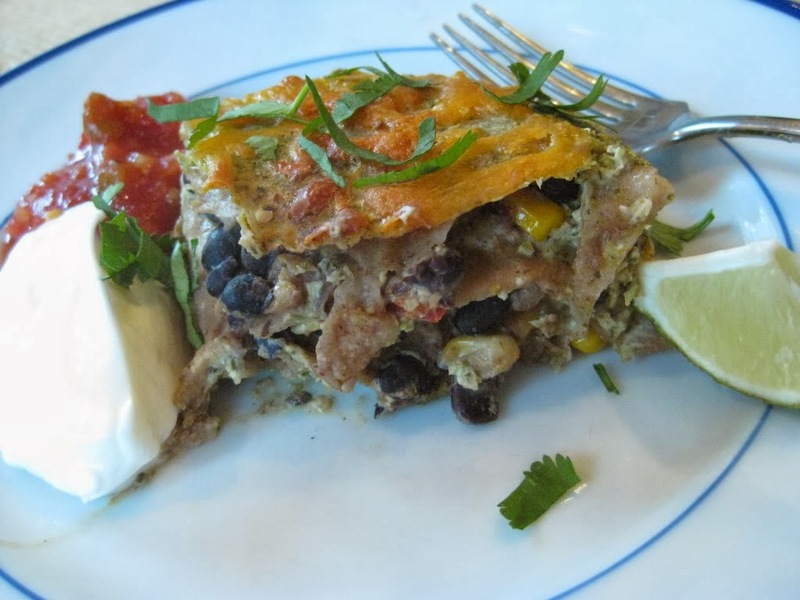 Either way, I had a recent request for more quinoa recipes, so here is my new favorite, based on an Eating Well recipe. The recipe below is wonderfully balanced between earthy and sweet. The quinoa and black beans give earthy tones, while the mango, sweet bell pepper and orange juice dressing combine to finish the dish with a suitable sweetness. Usually I make this with regular quinoa, but at Trader Joe's two weeks ago they were demonstarting red quinoa. I should have put a sign on my forehead that read "easy target" as I had a feeling I would probably pick up some, and once I tasted it, I was scoping some up before you could say "red quinoa." If you follow nutrition suggestions, many folks who are way more knowledgeable than I suggest eating a "rainbow" of fruits and vegetables. This salad has red, orange, yellow, green...and purple. G helped me make it this time, and he suggested we add some blueberries to make our rainbow complete. Maybe next time? Bring the water to a boil. Rinse the quinoa well and drain, and add to the boiling water. Reduce water to a simmer, cover and let cook 10-15 minutes or until all the water has evaporated. Remove from heat and let cool. In a large bowl, mix the orange juice, vinegar, ginger, sesame oil, salt and pepper. Add the quinoa and mix well. Add the remaining ingredients and toss well. Like most composed, marinated dishes, this tastes better if it is made an hour or so ahead of time, or even the day prior. Serves 6-8 as a side dish, 4 for a lunch or light dinner. 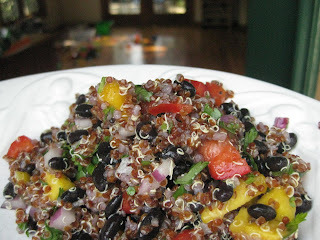 PS--Yes, it is Saturday night and I am posting a quinoa recipe. We leave tomorrow from my parent's house (Cleveland) for our annual week at Chautauqua (New York). I can't wait, and as I finish up some laundry and other pre-trip tasks, I am blogging too...it's going to be a wild night! Awesome! This reminds me how much I loved Quinoa as a child... it's going on the grocery list now!